Swiftly I'll fly to thee. Yuki-hira was the Governor of the Province of Inaba, and half-brother of the writer of the next verse (17); he died in the year 893, aged 75. 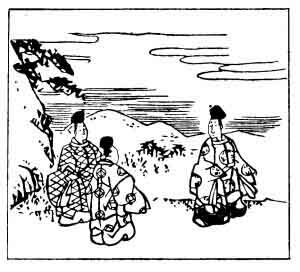 The word matsu in the original may mean 'a pine tree', but it may also mean 'waiting and longing for'. This is an instance of a 'pivot-word', imitated to a certain extent in the translation, although in English we have to employ the word twice over, while it only appears once in the Japanese. The illustration shows the pine tree on the mountain, and the poet standing under it with two attendants.